Back in 2011, Isaac Arcturian formed Auriel, a one man atmospheric black metal band. After 3 years, they have released their debut demo. Featuring only two tracks, Auriel delivers black metal that is packed full of haunting atmospheres, tortured screams and beautiful melodies, all within 16 minutes. Atmosphere is a big part of the demo and is presented in many different ways. The use of cold and haunting guitar riffs, howling winds and booming double kick forms an unforgettable feel to the songs. The mood of the tracks constantly shift around. At one point you could be enveloped in a sense of loneliness and despair while the next moment you feel like a light has shown over the landscape and you are surrounded with the beauty of the forest. The drumming on the demo is powerful but in the background enough so it does not cover up anything that is going on. While most likely programmed, time was put into the tracks to make sure they do not get repetitive and boring. The patterns change quite frequently to avoid this and there are some fills thrown in to help transition from one part of the song to another. The guitar riffs are very diverse and help to set the mood of both tracks. From clean, finger picked melodies to distorted, hard-hitting chords, Auriel does it all. There are also some odd riffs thrown in that break free of the black metal structure and bent the rules a bit. One particular example is in the intro track, Syysmyrsky. The rhythm and lead tracks play an upwards scale and suddenly pause for a beat, then repeat. It is a strange riff to hear in a song like this, but oddly enough it fits with what else is happening in the song at that point. The vocals are not present for much of the demo, giving the music room to fill up the space and speak for itself. When they are present, they sound tortured and scary, adding to the haunting atmosphere. At points, they are very reminiscent of the vocal work done on Darkthrones' Transylvanian Hunger. They are very far down in the mix, making it extremely difficult to understand what he is actually saying. 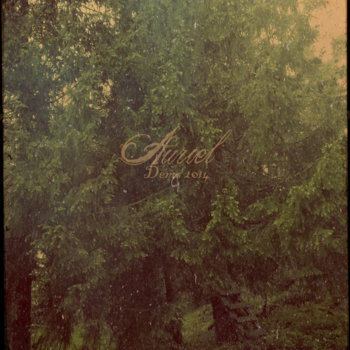 After lying dormant for three years, Auriel has finally shown its true potential through a mere 16 minutes of music. While always keeping a dark atmosphere at its forefront, Auriel delivers truly powerful riffs and beautiful melodies, sometimes at the same time. After this impressive debut, I am quite excited for what Isaac has up his sleeve for his next release.